Over the next month, I look at black coffee – the contraptions, the methods, the how to’s and the why’s. David Ruslie, Campos’ resident black coffee obsessive, walks us through aeropress, cold drip and pourover and explains why he’s so passionate about this back-to-basics approach. “Australian coffee culture is actually milk coffee culture, and I’m trying to change it,” David tells me. Single-handedly trying to convert us from flat-whites-with-one to siphon/cold drip/aeropress? Not so much, Dave says, but he’s excited to share the precision and hands-on nature of black coffee brewing with me. He kindly offered to walk me through these ‘third wave’ or ‘fourth wave’ (whatever it is we’re up to now) methods. We’re going to start with the chemistry lab setup that is cold drip. David explains that there are two basic methods of coffee making- immersion and percolation, and cold drip is full percolation. This method involves steeping fresh, coarse coffee grounds at room temperature over time, usually around 12 hours. This results in an extremely caffeinated, low acidity, sweet-tasting cold coffee, and a brew that non-espresso drinkers often warm to. ‘It doesn’t actually taste like coffee.’ says David, which is a good way of explaining the flavour- bright, mild and tea-like. As complex as this chemistry lab setup may look, you don’t necessarily need it to cold brew your own coffee at home. Similar results can be achieved by steeping coffee in a jar or overnight, and then pouring the resulting liquid through a coffee filter and chilling for future use. You can also do this in a French press, as you would for hot coffee but again, overnight. 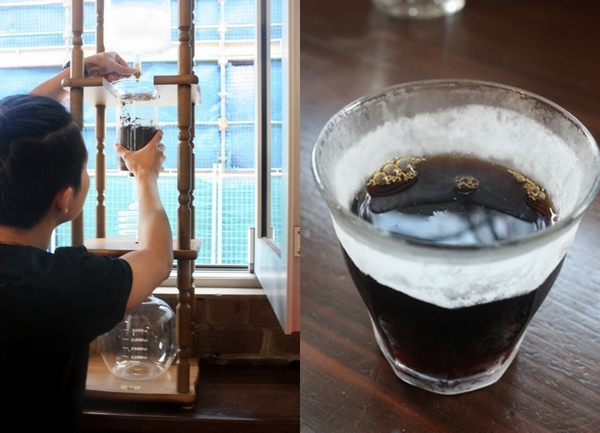 The video above demonstrates how cold drip is made. For more info on how to brew you own cold coffee at home, click here. Are you a cold coffee fan? What’s your fave way to enjoy it? i just tried cold drip after reading your post and absolutely love it! surprisingly refreshing! This is fascinating. It’s almost like making a coffee … stock? As an ex-Gaggia man who could never get it “right” and whose been on Nespressos for years, this could be worth a shot. Hmmmm….thanks! I don’t mind cold drip coffee-hubby really likes it though! If he had the time, he’d order one every day at work. I have never tried cold drip before but have always wanted to. I am going to give it a crack at home too! this post has reminded me that my next visit to campos is way overdue! might head over and try the cold drip! I got excellent results cold dripping with a coke bottle and a Chemex. If you cut the bottom off the coke bottle and suspend it upside down with a small hole in the lid you can pour water and ice in the top so that it drips through the hole. If you place the Chemex with ground beans and a filter underneath it will drip onto the beans and filter through perfectly into the bottom.